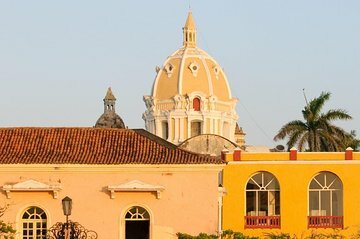 When your cruise ship docks at the picturesque port of Cartagena, explore the Caribbean color and cultural flair of the Colombian city during a 6-hour sightseeing shore excursion. Our guide will be waiting for you at the parking of the port. Visit the historical and architectural highlights of the UNESCO World Heritage Listed site while delving deeper into the city’s history with a knowledgeable guide. Stroll around the ambient Plaza de la Aduana and discover the stolid structure of the Castillo San Felipe, the entrance fee to which is included in the tour. Depart from your cruise ship docking point with your knowledgeable guide to begin your enriching exploration of the city. After disembarking your ship, you will take the free shuttle and will get off at the parking of the port, our guide will be there waiting for you with a sign under your name. Begin your tour in the picturesque historic center, over which the iconic Torre de Reloj clock tower reigns supreme. Capture this significant site on camera before gaining insight into the history of Plaza de la Aduana, a site on which hundreds of slaves were traded long ago. Next, visit the sacred structure of the Cathedral of Cartagena, a majestic building that boasts a buttery sandstone façade and an intricately decorated interior. Then, immerse yourself in the glittering exhibitions of the Gold Museum, discovering the pivotal role of the precious metal in Colombia’s history. Pass by the picturesque Theater of Herdeia in the ambient Plaza de Bolivar on your way through the important historical city. Arrive at the legendary landmark of Castillo San Felipe (San Felipe Castle) a foreboding fortress perched upon the hilltop of San Lazaro. Explore the interior with your guide, learning about the destruction and danger experienced by the fort as you appreciate stunning views of the Caribbean coast. Conclude your tour by visiting the Bohemian neighborhood of Bovedas, an artistic enclave famed for its galleries and creative craft stalls. Browse boutiques for bespoke souvenirs before returning to your docking point well in advance of your ship’s departure. We will ensure your timely return to the Cartagena port for this activity. In the rare event your ship has departed, we will arrange for transportation to the next port-of-call. If your ship is delayed and you are unable to attend this activity, your money will be refunded. See our terms and conditions for full details.